How much is Joy Villa Worth? Joy Villa net worth: Joy Villa is an American singer and songwriter who has a net worth of $500 thousand. Joy Villa was born in Orange, California in April 1986. Her debut studio album I Make the Static was released in 2014. Her great uncle was jazz singer Kenny Hagood. 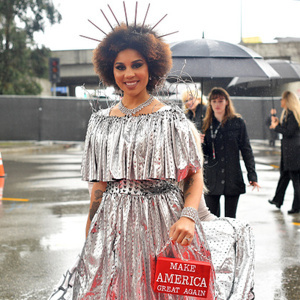 Joy Villa has become known for her attention grabbing outfits as well as her political views. She can often be seen at the Grammy Awards where she wore a see-through dress made from orange construction-fencing material in 2015. At the 2016 Grammy Awards she wore a dress made of fabric spikes and in 2017 she wore a Make America Great Again Dress. Villa wore a pro-life dress at the 2018 Grammy Awards and a Build the Wall dress at the 2019 Grammy Awards. She was a member of President Donald Trump's Campaign Advisory Board. She has appeared on Fox & Friends and said that she may run for United States Congress as a Republican in Florida.